You are already registered and logged in. It looks like your subscription is expired. We're sorry, but access to the Conceptual Estimator is restricted to current, paid subscribers only. If you feel you are receiving this message in error, or if you would like to start a paid subscription, please call us at 1.800.533.5680.
paid subscription in order to access the Conceptual Estimator. With Simpl•Est Unit Price , you get a complete estimating solution for just $12.95 a month and you can cancel at anytime. You get full access to the online 2019 BNi General Construction Costbook along with a powerful search tool! For over 30 years, the BNi General Construction Costbook has set the standard for accuracy in construction estimating. Starting here ensures you don't overlook a single item. Just click on any item in the book to add it to your estimate. It's automatically saved for you in the cloud. You can change quantities, add comments and more. Everything in your estimate is downloaded to an Excel spreadsheet where you fine tune your estimate and print a complete final report! Sign up for Simpl•Est Unit Price now and get FREE unlimited access for a full month, plus a FREE digital subscription to DCD. After that, continued access to Simpl•Est Unit Price is billed at just $12.95 a month. It's an incredible value for such a powerful estimating solution, but don't take our word for it ... try it for yourself - free! With Simpl•Est Square Foot, you get unlimited access to a cost database featuring nearly 2,000 actual building projects! You get detailed cost-breakdowns for schools, hospitals, municipal buildings, offices, multi-family housing, restaurants, retail stores and much more. And that's just the beginning! Once you select a building category, you can then drill down on projects that match foundation types, roof types, interior and exterior wall types, and other criteria. Then at the click of a mouse, you can add, change or delete cost items to suit YOUR projects specs. You can also change the square foot size of the project, and even the project's location. Instantly you'll see the recalculated total project cost, along with all the cost details. Simpl•Est Square Foot answers the question "How much will it cost to build?" With Simpl•Est Square Foot you can run your own "What If" scenarios. Check out the costs of different building types. Get a reality check on a bidder's estimate. Demonstrate the impact of a change order. With Simpl•Est Square Foot you can estimate with greater confidence than ever before. Try Simpl•Est Square Foot FREE for 30 days. Just click the button below to get started right now. We'll give you a full month to explore the power of Simpl•Est Square Foot. Then if you wish to continue using Simpl•Est Square Foot, we will bill you just $9.95 a month. Plus we'll send you a Free copy of the 2019 DCD Guide to Construction Costs (a $69.95 value). Why wait? If you do any kind of estimating work, you owe it to yourself to give Simpl•Est Square Foot a try. Try Simpl•Est Davis-Bacon FREE for 30 days. Just log-in and then click the Try it Free button below to get started right now. We'll give you a full month to use Simpl•Est Davis-Bacon. Then if you wish to continue using it, we will bill you just $4.95 a month.Why wait? If you are responsible for hiring sub-contractors, you owe it to yourself to give Simpl•Est Square Foot a try. Proprietary Rights. Unless otherwise noted, all written and/or other materials that are part of our eBook, including information, images, illustrations, designs, icons, data, software, photographs, graphs, videos, typefaces, graphics, music, sounds and other material (collectively "Content"), are protected by copyright, trademark, patent or other proprietary rights, and these rights are valid and protected in all forms, media and technologies existing now or developed in the future. Except as provided in Paragraph 2 below or authorized or licensed to Subscriber in writing, Subscriber may not copy, modify, remove, delete, augment, add to, publish, transmit, participate in the transfer or sale, lease or rental of, create derivative works from or in any way exploit any of the Content, in whole or in part. All Content is copyrighted as a collective work under United States and international copyright laws, and as between Subscriber and BNi, BNi owns, to the fullest extent allowed by such laws, the copyright in the selection, coordination, arrangement, and enhancement of all Content. The BNi trademarks, logos and other trademarks on our eBook are the property of their respective owners and are owned by, licensed to, or, where required, used with permission of BNi, and, as such, may not be reproduced, copied, or manipulated in any manner without the express, written approval of the trademark owner. Your Use of the content. The eBook and the Content are intended solely for use by one Subscriber working at one computer workstation ("Workstation"). You acknowledge and agree that the eBook may permit Subscriber to copy or download portions of the Content and/or other downloadable materials displayed on the eBook ("Excerpts"), but BNi may restrict or impose limitations on Subscriber's ability to copy or download Excerpts, in BNi's sole and absolute discretion. With respect to such Excerpts, Subscriber agrees to leave intact all copyright, trademark and other proprietary notices contained in such material, and will not modify or alter the material or copy or post the material on any network computer or broadcast the material in any media whatsoever. Subscriber may not modify, transmit, distribute, use or reuse, repost or "frame" the Content for public or commercial purposes without express written permission from an authorized representative of BNi. No right, title or interest in any Content is transferred to the Subscriber as a result of the Subscriber's downloading or copying of an Excerpt. Except as noted above, Subscriber shall not publish, transmit, distribute, display, modify, create derivative works from, sell or participate in any sale of or exploit in any way, in whole or in part, any of the Content, the eBook, Excerpts or any related intellectual property. As a condition of using the eBook, Subscriber agrees that if BNi, in its sole and complete discretion, requests in writing that Subscriber remove any link or links to the eBook, Subscriber will promptly do so. Subscriber further agrees that BNi may, in its sole and complete discretion and at any time, terminate Subscriber's access to and use of our eBook, or any part thereof, with or without notice to Subscriber. Subscriber agrees not to tamper with our applications, misrepresent Subscriber's identity, conduct fraudulent or unauthorized activities in connection with our eBook, or use agents to do any of the same. Subscribers are prohibited from violating or attempting to violate the security of our eBook, including, without limitation, (i) accessing the eBook from more than one Workstation at one time; (ii) providing Subscriber's access information to others, and/or allowing others to access the eBook using Subscriber's access information; (iii) accessing data not intended for such Subscriber or logging onto a server or into an account which the Subscriber is not authorized to access; (iv) using our eBook for unintended purposes or trying to change the behavior of our eBook; (v) attempting to probe, scan or test the vulnerability of the eBook; (vi) attempting to interfere with other Subscribers' access to the eBook, including without limitation via means of submitting a virus to our eBook, overloading, "flooidng," "spamming," "mailbombing" or "crashing"; (vii) forging communications on behalf of our eBook (impersonating our eBook), or to our eBook (impersonating as a legitimate Subscriber). Sending unsolicited and unauthorized e-mail on behalf of BNi, including promotions and/or advertising of products or services, is expressly prohibited. You agree not to use any device, software or routine or data to interfere or attempt to interfere with the proper working of our eBook or any activity being conducted on this eBook. You agree, further, not to use or attempt to use any engine, software, tool, agent, data or other device or mechanism (including without limitation browsers, spiders, robots, avatars or intelligent agents) to navigate or search or remove Excerpts from our eBook other than the tool or tools provided by the eBook or by generally publicly available and acceptable Internet browsers. If and when requested, you agree to provide true, accurate and complete Subscriber information to BNi. LIMITATION OF LIABILITY. NOTWITHSTANDING ANY PROVISION TO THE CONTRARY, WHETHER CONTAINED IN THIS AGREEMENT OR OTHERWISE, IN NO EVENT SHALL BNI'S AGGREGATE LIABILITY HEREUNDER EXCEED THE AMOUNT OF THE FEES PAID HEREUNDER TO BNI IN THE SIX MONTHS PRIOR TO THE DATE ANY DAMAGES WERE INCURRED. THIS LIMITATION SHALL APPLY TO ALL CAUSES OF ACTION AND CLAIMS IN THE AGGREGATE, AND SHALL APPLY NOTWITHSTANDING ANY FAILURE OF THE ESSENTIAL PURPOSE OF ANY LIMITED REMEDY. Errors, Corrections and Changes. Occasionally there may be information on our eBook that contains typographical errors, inaccuracies, or omissions that may relate to product descriptions, pricing, and availability. We reserve the right (and we will use commercially reasonable efforts) to correct any errors, inaccuracies or omissions. Additionally, we reserve the right to change or update information at any time without prior notice. Indemnity. You agree to indemnify, defend and hold harmless BNi, its agents, employees, partners, affiliates, subsidiaries and suppliers from any liability, loss, claim and expense (including attorneys' reasonable fees as incurred) related to your violation of this Agreement or in connection with your use. Miscellaneous If any part of this Agreement is determined to be invalid or unenforceable pursuant to applicable law including, but not limited to, the warranty disclaimers and liability limitations set forth above, then the invalid or unenforceable provision will be deemed superseded by a valid, enforceable provision that most closely matches the intent of the original provision and the remainder of the Agreement shall continue in effect. Unless otherwise specified herein, this Agreement constitutes the entire agreement between Subscriber and BNi with respect to the eBook, and it supersedes all prior or contemporaneous communications and proposals, whether electronic, oral or written, between Subscriber and BNi with respect to the eBook. A printed version of this Agreement and of any notice given in electronic form shall be admissible in judicial or administrative proceedings based upon or relating to this Agreement to the same extent and subject to the same conditions as other business documents and records originally generated and maintained in printed form. Your subscription may have expired. Thank you, [first name] for registering on Design Cost Data! As a registered user you can try any Simpl•Est module FREE for 30 days. Just click the Try it Free link below the module of your choice. SAN DIEGO (January 24, 2019) – Ware Malcomb, an award-winning international design firm, today announced construction is complete on the exterior, lobby and amenity renovations of 525 B Street in downtown San Diego. Ware Malcomb provided architecture, interior design and branding services for the project. Ware Malcomb worked with Hines, the building’s property management company, on common area renovations of the Class A, 22-story office building. 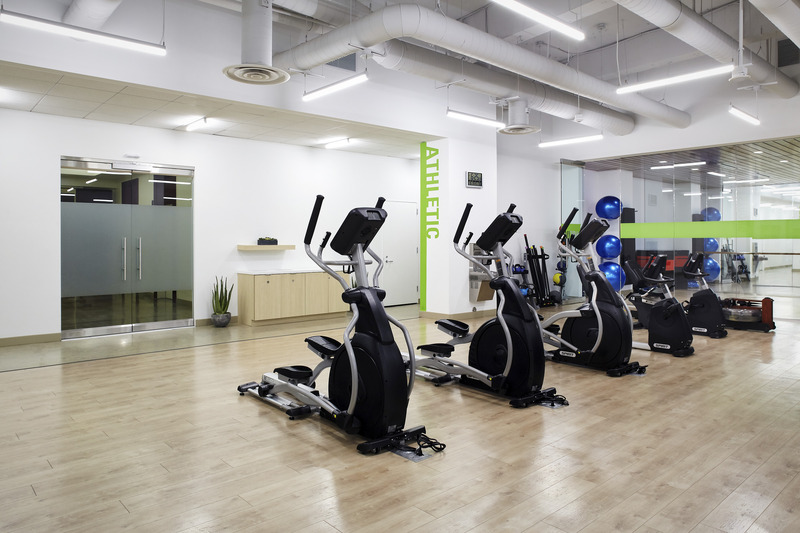 The project included a renovation of the main building lobby and a 3,100 square foot gym renovation featuring a state-of-the-art fitness center, spa-like showers and lockers. “We were excited to transform the existing lobby and gym area into modern and inviting spaces, creating the kind of office environment today’s companies and employees have come to expect when they work downtown,” said Catharine Hughes, Director of Interior Architecture & Design in Ware Malcomb’s downtown San Diego office. 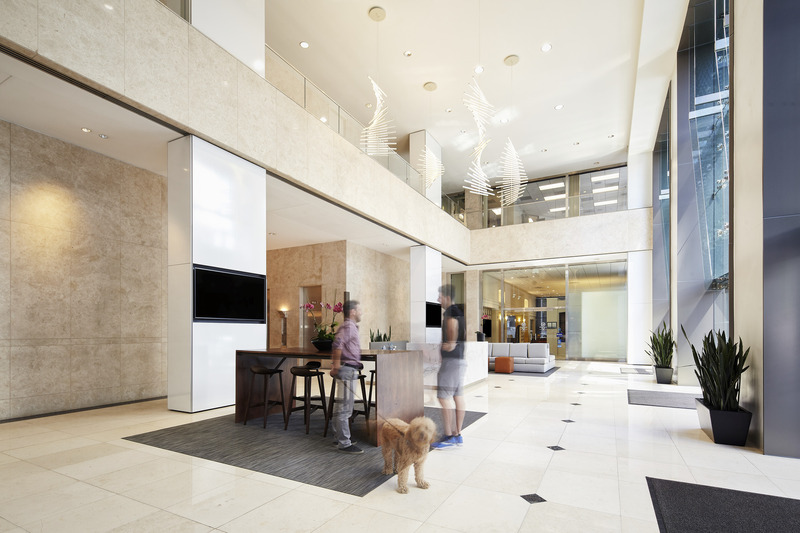 “To maintain the sustainable nature of the building, we were able to preserve most of the existing lobby finishes while adding additional design features for a sophisticated new look,” added Tiffany English, Principal of Ware Malcomb’s San Diego offices. 525 B Street is certified LEED Gold by the U.S. Green Building Council and has earned the Environmental Protection Agency’s Energy Star Premier certification. The General Contractor for the project is Bycor. Ware Malcomb maintains two offices in San Diego: one office is located at 600 B Street, Suite 2070 in downtown San Diego, and the other office recently relocated to a new, larger space at 3911 Sorrento Valley Blvd, Suite 120 in San Diego. The move was driven by the growth of the firm’s local employee and client base. Established in 1972, Ware Malcomb is an international design firm providing planning, architecture, interior design, branding and civil engineering services to commercial real estate and corporate clients. With 22 office locations throughout the United States, Canada, Mexico and Panama, the firm specializes in the design of commercial office, corporate, industrial, science & technology, healthcare, retail, auto, public/educational facilities and renovation projects. Ware Malcomb is recognized as an Inc. 5000 fastest-growing private company and a Hot Firm and Best Firm to Work For by Zweig Group. The firm is also ranked among the top 20 architecture/engineering firms in Engineering News-Record’s Top 500 Design Firms and the top 30 interior design firms in Interior Design magazine’s Top 100 Giants. For more information, visit waremalcomb.com/news and view Ware Malcomb’s Design Highlights video at youtube.com/waremalcomb. for a 30-day FREE trial!